The Sweet Scent of French Hybrid Lilacs is Unforgettable! 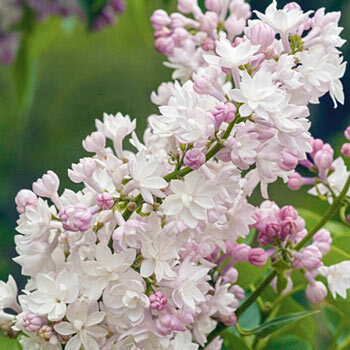 Extremely dense flower clusters make this one of the most beautiful lilacs you can grow. Soft pink buds burst open to reveal white blooms with just a hint of pink. We have selected five of the very best lilacs for American gardens. Lilacs are great for the back of a border or hedging, and make spectacular cut flowers—one bloom cluster can perfume a whole room! Foliage Type: Pale green, heart shaped leaves, 4" - 5". Flower Form: Double flowers forms 5"- 8" panicles. Planting Instructions: Plant at the same level it is growing at in the container, firm and water in well. Soil Requirements: Well drained garden soil enriched with humus. 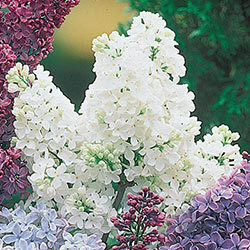 Additional Information: The top rated Lilac by Father Fiola, the famous Lilac breeder and expert. Bred in Russia by the great Russian lilac hybridist Leonid Kolesnikov.